An internal project with working title “The glass of medieval Brno” started in 2000 in relation to the processing of older glass finds as well as of the new ones from the area of Velký Špalíček in Brno. With the project management was entrusted an external co-worker of our company PhDr. Hedvika Sedláčková, CSc who also performs the complete processing of proper glass. With the interpretation of finding situations and their historical context is continuously concerned a team of archaeologists of the company Archaia Brno. For the time being, the finds from 130 sunk-into-ground features had been processed, i.e. ca 2200 items which are deposited in the Brno City Museum representing about 90 % of all the finds from Brno as in February, 2005. The sense and goal of the project is the processing and evaluation of all the finds of medieval hollow glass of the 13th – 15th centuries from Brno with regard to the other finds from the South-Moravian region. The glass objects from archaeological excavations at the historical core of Brno had been so far processed and published selection-like only. However, the assemblage from Brno appears by its amount and quality one of the most abundant and significant units within the Middle-Danubian region (about 2000 items). Until around 1400 there occurred mostly imported glass, above all from Italy probably, to a lesser degree from the territory of German lands. Since the mid-14th century also some domestic products appear which got predominant after the year 1400. The processing of all the finds from Brno not only allows the elaboration of a typology and chronology with supra-regional validity but also undoubtedly contributes to solving problems of origin of imported glass and trade connections in the Middle Ages. At selected assemblages from particular time spans also the evaluation of further components of material culture will be executed with accent on some exclusive or as well imported goods. The final outcome of the project will be a book containing the fundamental study on the development of the Brno glass, the catalogue of finds supplemented by the characteristic of another components of material culture and finding environment as well as the study dealing with the trade connections of Brno and South Moravia with possible lands of glass origin or some possible import mediators. Preliminary results of the project: there is a surprisingly large amount of hollow and window glass coming from the archaeological excavations at the historical core of Brno which have been carried out here since the mid-1980s. The vast majority of finds comes from sink fillings, to a lesser degree from wells. Very rich and significant assemblages occur above all on the area of so-called Velký Špalíček, mainly in the Dominikánská St. 5 and 7, Dominikánská St. 11 – 19 and Mečová St. 2 but also in Dominikánské square, Náměstí Svobody (Liberty Square) 17 (“The Mansion of Lords of Lipá”), in the Kozí St. 4, Kobližná St. 3 and 4, Petrov No. 2 as well as Panenská, Jakubská and Rašínova Streets. On the basis of the hollow glass assemblages analysed and confronted with present state of knowledge of chronology of the material culture in medieval Brno there could be six time periods distinguished within a time span of 1240 – 1550, during which a modification of form scale came into being. Within these periods a typology of imported glass and a typological base of domestic glass could be elaborated. The preliminary results also show that until the mid-15th century Brno was supplied mostly by imported high-quality glass of Mediterranean (Italian) origin. The import was restricted to Brno and its closest vicinity only. In the towns of Central and North Moravia or in Bohemia these articles appear only sporadically. The products of local glassworks become accepted at the Brno market during the 15th century, however, the typology thereof isn’t yet elaborated. German goods reached Brno as late as in the second half of the 15th century and they are limited to several basic types. 1) Jug (I.1. ), beaker with optical decor (IV.1.) 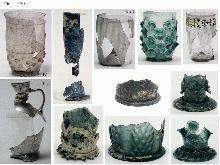 and fragments of cups (VII.1.) of colourless glass. 2) The largest group consists of bottles with inner ring made of vivid green (III.1. ), blue (III.2. ), brown or violet glass (III.3.). 3) Bottles with applied ribs (II.1., 2.) of tawny, deep violet or yellowish glass are known from this time period only. 4) The vessels of vivid green glass were probably manufactured on the Transalpine territory, the other ones supposedly originated from Mediterranean (Italian) glassworks. From this time period come the richest assemblages. Some types and variants occur on the assumed area of the Margrave’s residence only. 1) The largest group is represented by several variants of prunted beakers (IV.1.1. ), the items with large snail-like prunts are all of brown/tawny glass. 2) Beakers with thorn-like prunts (IV.1.2.) and those with small, coiled prunts (IV.1.3.) are made of slightly greyish glass. 3) The second most abundant are the bottles with inner ring (III.3), mostly of greyish glass. 4) There are also numerous cups, mainly those with fine (VII.2.) and distinct (VII.3.) ribs. 5) The products made of brown/violet glass decrease in number. The amount of finds remained the same, however, we can observe some repertoire modification. 1) Besides a small jug made of glass of seal-wax colour (I.1.) the first jars (I.2.) begin to appear. 2) Surprisingly abundant are the table bottles (I.3.). 3) Bottles with inner ring (III.3.) decrease in number, and just as the prunted beakers (IV.1.) and cups (VII.2., 3. ), they are manufactured either of thick-walled greyish glass or of thin-walled, completely colourless glass. 4) A new variant is represented by ribbed beaker (IV.4.2.). 5) Prunted beakers are often small-sized. 6) Exceptional types come again from the area of possible Margrave’s residence (VIII.). 7) The products made of brown/violet glass fade out. 8) Table bottles, prunted beakers and glasses also occur at noble residences around Brno. 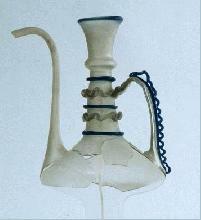 9) Gradually also some products of Bohemian or Moravian glassworks (e. g. IV.1.5.) begin to appear in the assemblages. About 60 % of the finds are represented by the products of domestic glassworks, mainly the tall glasses of Bohemian type. The form scale of imported vessels got considerably decreased and innovated and now we can find glass also in the environment of weaker urban classes. 1) Bottles with inner ring fade out already. 2) Prunted beakers are represented just by the variants with thorn-like prunts (IV.1.2. ), the body is barrel-shaped with low rim. Several items are manufactured of pale blue-green glass. Some tiny prunted beakers we can regard as children’s toys. 3) As a novelty occur the beakers with polygonal cup (IV.1.4.) and a tall plain upper part (IV.1.7.). The content of this period is known from several rich sinks in the milieu of clerical dignitaries and urban patrician houses, and the imported glass represents about 30 % of all finds. 1) Ribbed beaker with enamel decor, tall prunted goblet of blue glass and fragments of several another vessels originate from Italian (Venetian) glassworks. 2) From German glassworks came mainly the products of pale blue-green glass: barrel beakers with large prunts, tall cylindrical goblets with large prunts, beakers with optical decor of ribs and lenses. 3) Plain beakers. Vessels of so-called forest or colourless glass occur in a lesser amount. 4) Some types familiar in Germany, e. g. the drinking vessels named “Maigelein” or “Kreuzrippenbecher” occur neither in Brno nor somewhere else in Moravia. 5) Of German origin could be also some pieces of tall club-like goblets (Keulenglas). Černá, E. 1994: Středověké sklo v zemích koruny české. Katalog výstavy, Most, s. 105 - 107. Himmelová, Z. 1990: Sklo středověkého Brna – Mittelalterliches Glas in Mähren. In: Archaeologia Historica 15, s. 437-445. Merta, D. - Peška, M. - Sedláčková, H. 2002: Příspěvek k poznání středověkého skla z Brna – Ein Beitrag zum Erkentniss mittelalterlichen Glases aus Brünn. In: Pravěk NŘ 12, 359-412. Brno. Sedláčková, H. 2003: Typologie des Glases aus dem 13. und 14. Jahrhundert aus Brünn, Mähren. In: Auf gläsernen Spuren. Berichte zur mittealaterlichen Archäologie in Österreich Band 19, 127-138. Wien. Sedláčková, H. v tisku: Abriss einer Typologie der mittelalterlichen Glasimporte aus Brno/Brünn, Mähren (Tschechische Republik), Annales du 16e Congres de l´Association Internationale pour l´Histoire du Verre (London 2003 – odevzdáno do tisku v lednu 2004). Hedvika Sedláčková 2005: Abriss einer Typologie der Mittelalterlichen Glasimporte aus Brno/Brünn, Mähren, Tschechische Republik. In: Annales du 16e Congrés de l'Assotiation Internationale pour l'Histoire du Verre, 2003. London 2005, S. 237-240, CP 72 und 73. Hedvika Sedláčková 2003: Typologie des Glases aus dem 13. und 14. Jahrhundert aus Brünn, Mähren. In: Beträge zur Mittelalterarchäologie in Österrreich 19, 2003, S. 127-138. Hedvika Sedláčková 2006: Středověké sklo z Opavy. Das mittelalterliche Glas aus Opava (Troppau). In: Památky archeologické XCV, 2004, pp. 223-264. Mährere Glasfunde aus Brünn und Olmütz sind durch Münzen, dendrochronologische Daten und Schriftliche Quellen datierbar zwischen ca 1450 bis 1560. Weiter Antwerpen Poster 2006. The project has been realized so far without any external financial support, mainly at own costs of PhDr. Hedvika Sedláčková and the company Archaia Brno.